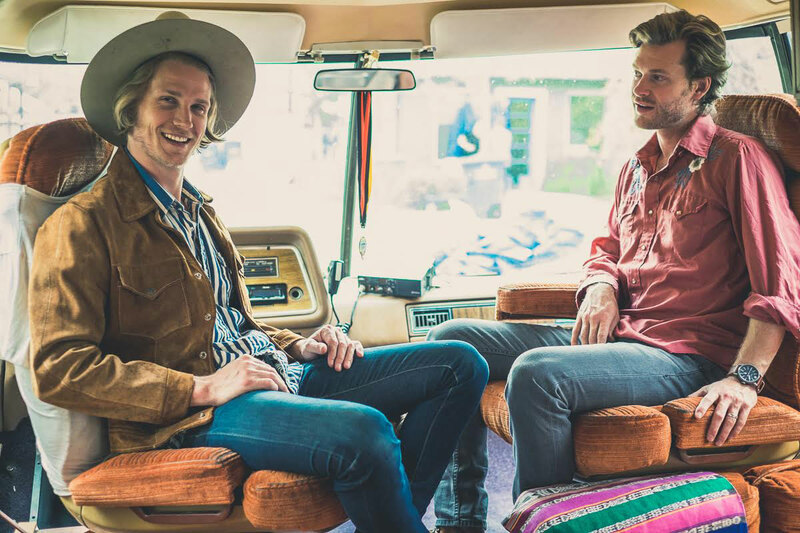 Jamestown Revival is the “back porch Americana-rock” duo Jonathan Clay and Zach Chance. Their highly autobiographical album “Utah” was named Singer-Songwriter Album of the Year by Itunes. They’ve played festivals across the country, including South by Southwest, Coachella Valley Music and Arts Festival and Austin City Limits Music Festival. We talked to them about their exodus to California, their recent return to Austin and the ways that travel inspires their music. Jonathan: Zach and I have been friends since we were 14. We grew up in small town outside of Houston called Magnolia, which is where we wrote our first song together. We were roommates in college, too. We officially started Jamestown Revival in 2011 after moving to Los Angeles. We lived there for 3 years, wrote an album about it, and then we moved back to texas. We live in Austin now. Zach: I once married a couple. I’m an ordained minister! Jonathan: I’ve never married anyone, but I got married myself when I was quite young. I was 23 and Zach was my best man. What was your first travel experience as a band and how did it affect you? J: When we first started the band we used to tour around really small places. We played bars, restaurants, people’s backyards… anywhere that would have us, really. We toured in a Chevy Tahoe with all of our gear piled inside, and we slept at truck stops mostly. We had our camping gear, and we would set it up in the back of the Tahoe. We were playing for anyone, sometimes 5-10 people at a show. I felt like we were squared up with our worst case scenario and it wasn’t that bad! As long as the car was still running we were okay. This whole experience was an adventure. It gave us courage. It allowed us to see so much and taught us to take a DIY approach to our career. You learn so much by traveling like that. You meet so many interesting people and get so much perspective when you’re able to live so freely. We stumbled upon so many things we wouldn’t have if we had stayed in our comfort zone. When we had a couple days off between shows we would go camping in national parks. Z: Since then, our crew has grown from just the two of us to eight or nine people at a time. It’s an amazing family, and it brings brotherhood, but there was something special about traveling in the back of the car like we did in the beginning. We had more time to explore back then. It’s really nice to tour like we do now, though. It’s nice to leave some of that fear of uncertainty behind. What are specific ways in which the places you’ve lived inspire the work you do? J: The concept of home plays a large role in our lives. There are two sides to that coin: There’s homesickness when you’re away and restlessness when you’re home for too long. Z: Being songwriters, we’re observers. We’re people watchers. When you travel enough you get to see the differences between the ways people live in different places. Seeing how people interpret their ideas of home in different places influences our songwriting. We’ve picked up certain phrases and ideas along the way from all of the people we’ve met. How has that impacted your work? J: The song “Revival” is representative of where we were in the beginning, during those first tours. It’s about living loose without a dollar to your name, not caring too much and living free. “California” is a song about our move to Los Angeles. It’s about that feeling of being unfamiliar with the land, and being away from home. It’s also about how we decided to move back. California is our home away from home now, but it’s not Texas. How would your work be different if you didn’t live in this place? J: When we lived in California we felt the difference in folk music compared to Texas. There’s the Laurel Canyon Sound that’s represented by a lot of our influences like Jackson Browne, The Eagles and Crosby, Stills and Nash. California country is a distinct spin on country music. It’s Merle Haggard. It’s Glen Campbell. Texas country is different. Whether or not it’s a conscious decision, it affects you. In California you’re by the ocean every day and it’s more relaxed. Texas is hot in the summer and has a real winter. Different environments shape your emotions, and that shows in our music. I think that what’s most fun about traveling, getting a feel for places by living like a local. If you have too much of an agenda you might get a tourist’s perspective. What are some other places or spaces you have visited that inspire your creativity? J: One thing that was really cool last year is that we got to go to Australia and New Zealand to play. We wanted to go there anyway, but to get to do it for work–to play music, that was great. Wherever we travel there are these places we find along the way. There’s this one gas station up along the California coast, Castle Crag, that brews their own beer. We always stop there, grab a beer and just spend a couple of minutes looking at the mountains. I feel like vacations are often about getting to a destination and then staying in one place. Journeys are interesting because they’re about stopping more and discovering things. Zach: Yeah. Especially when you’re in a car. It’s more open to opportunity than traveling by plane. There’s more room for adventure. We really love going to Colorado and Utah, too. We recorded our album near Park City– that’s a place that inspires us and that we always enjoy going back to. Are there places you’d like to visit that you imagine would inspire you? J: We’d love to do a European tour, especially to visit Germany. For some reason, the top three cities that listen to our music on Spotify are all in Germany. I feel like Europe has a great appreciation for live music. I think touring there would inspire us in similar ways to what moving to California did. Being wide eyed and a little bit overwhelmed, but taking it all on. That we get to travel as part of making music for a living makes it really special. Have you ever been to a place thinking it would influence your work in a certain way and then came out with a different outcome? J: I think I have learned to try not to have too many expectations because of exactly this. If you do have all these expectations about a new place then you’re not open to all of what might present itself. I think that what’s most fun about traveling is getting a feel for places by living like a local. If you have too much of an agenda you might get a tourist’s eye view. What is a recent project you’ve worked on that relates to space, place or community? Z: We wrote most of the songs on our record in the garage of a house I was renting at the time. Jon lived nearby, and he would come over at least five days a week. Certain settings can be so inspiring, That setting played a big part in how the record turned out. We wrote 90% of the songs on our album in that garage. J: I love creating in general. I’m obsessed with building things. Having a garage again since we’ve moved back to Texas has opened up a whole world to me. I’m a hobby metalsmith and woodworker. I also like to work with engines and electronics. I’ve worked a lot on motorcycles and vintage stereo equipment in particular. I think hi-fi systems in the 1970’s really did it right, so I love to find and restore those in my free time. Z: I’m not a builder like Jon. I usually come over and sit in the corner drinking and laughing. We really appreciate our space now. Since moving back from California we can afford more space and more access to the outdoors. We love the outdoors. We’re camping, hiking and fishing any chance we can get. Melissa is a writer and copyeditor. She loves sewing, cooking and motorcycle rides along the California coast.